It’s rather astonishing to look at Marvel Studios’ rapid cinematic rise over the last seven years, winning not just the hearts and minds of longtime die-hards, but of men, women and children the world over. Pair that astonishment with the incredible trajectory set by recent “Phase Two” entries like the Russos’ edge-of-your-seat political thriller Captain America: The Winter Soldier and James Gunn’s just plain satisfying sci-fi adventure Guardians of the Galaxy, and you’ve got every reason to be very, very excited about Joss Whedon’s superhero re-assembly, Avengers: Age of Ultron. To be sure, Age of Ultron is a great summer movie. There’s true blockbuster spectacle throughout the two-hour plus running time that, when it comes to just plain fun, easily tops anything we’ve seen on the big screen this year. Whedon’s script is, naturally, packed with clever quips and there are enough cameos and inside jokes that we’re likely to be finding surprises in Age of Ultron for some time to come. And yet too much is never enough and there is, admittedly, a disappointment factor to Ultron somewhat reminiscent of Marvel’s own early sequel entry, Iron Man 2. Similar to how the earlier followup debuted Scarlett Johansson’s Black Widow, Ultron brings important new characters to the MCU that, in the interest of screen time, simply don’t get their full due and wind up feeling more like they’re being placed on the chess board for later use. The backstory and character motivation for Quicksilver and Scarlet Witch, for instance, is reduced to a brief monologue. While it’s certainly plausible that we could like these characters, we don’t have much time to feel the world from their perspective or understand the specifics of what their lives have been to the degree that their team-up with Ultron isn’t all that far removed from Spider-Man 3‘s infamous Venom/Sandman alleyway conversation. All around, there’s a chaos to Age of Ultron that, while it works for the film’s rapid blockbuster thrill ride pace, really leaves one hungry for more when all is said and done. Having pulled it off in the comics for decades, Marvel is quite adept at “No-Prizing” certain elements of their narratives. That is, offering later explanations to explain apparent oversights or seeming inaccuracies. To that end, there’s a million simple stories that can explain everything we don’t get to see in Ultron, but that’s also a million questions that don’t ever get answered. Why is Tony Stark Iron Man after he stopped at the end of Iron Man 3? How, in the wake of the events of The Winter Soldier, did Cap not just rejoin the Avengers but actually become the leader of the team? It’s not that these stories need to be told on screen, but it’s infuriating to have the film skip over them in favor of say, Thor’s storyline wherein, for a good chunk of the film, Hemsworth’s hero effectively sees a teaser for Thor: Ragnarok and then goes on a quest to watch the full trailer while the audience is left wishing we just had a few scenes with Ultron instead. Ultron, by the way, is a grand super villain, the likes of which have been sorely lacking in the MCU and James Spader is beyond inspired in the role. His mission as a foe is, in many ways, to “reboot” the Marvel Universe and the film finds a wonderful metanarrative in setting the Vision as the Apollo to Ultron’s Dionysus. As such, Age of Ultron is, ultimately, a film about balance and there’s a particular sublimity to the ways in which these various heroes have found to balance their own lives against the chaos all around them. Some have found their path in love and others in solitude. Others, too, have their secrets and, as one such character with a few surprises to reveal, Jeremy Renner’s Hawkeye emerges truly well served in the overall narrative. 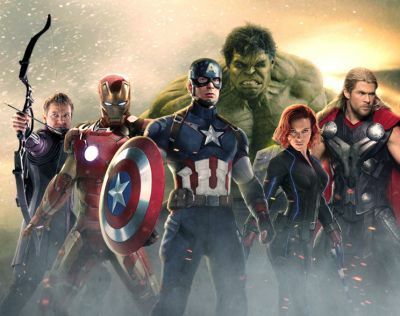 There is truly a great deal to love about Avengers: Age of Ultron. All around, Whedon manages incredible brushstrokes with a palette made of pop art iconography and a true understanding of the characters. This is strong summer fare that nevertheless fails to come together as the mighty Marvel masterpiece it should. It’s a soufflé that didn’t quite rise but is nonetheless exceptionally tasty, especially when served with tempered expections.